WHAT IS THE SPIEGEL GROVE? The USS Spiegel Grove is a Landing Ship Dock (LSD 32), which has been sunk to create an artificial reef in Key Largo. The vessel is 510 feet in length, 84 feet wide. She resides at a depth of 134 ft near Dixie Shoals in Key Largo. 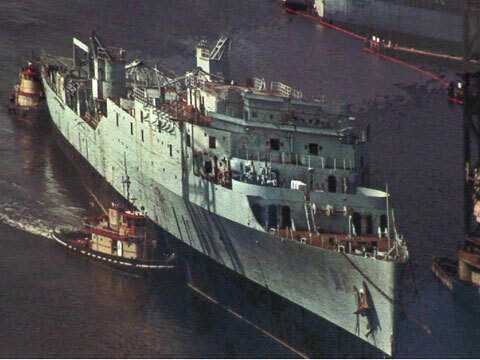 The depth at the highest point of the ship is 60-65 ft, depending on the tide level.Since her sinking in 2002, the Spiegel Grove had been lying on her starboard side. Due to the waves/currents/surge from Hurricane Dennis, the Spiegel Grove now sits upright. To defray the costs of cleanup, preparation, and towing, the Key Largo Chamber of Commerce Artificial Reef Committee will be selling medallions which will be required for divers wishing to visit the artificial reefs off the Upper Keys.